During the past few weeks, I entered my fourth decade in my life as I turned 30 on the 18th. As soon as I turned 29 last year, I felt like I had a good sense of what would life could be like in my 30s. I celebrated this milestone year first with a surprise party organized by family and friends on the 12th, then on the 18th with a night out at the upscale Mexican restaurant, and finally on the 19th, a family run party for me in Marshfield. The days were filled with many excitable moments and was a great introduction for life in this new decade. On the afternoon of Saturday, August 12th, I attended my second cousin Tim Murphy’s annual summer cookout with my family at his house in Cohasset. Not only did my immediate family attend, but also my Aunt Lorraine and many relatives from Dad’s mother’s side. It was also joyful to see Tim and wife Courtney’s two young daughters, Vivianna and Francesca, at the party. After the cookout ended, I headed into Boston to stay at my older brother Brian and his wife Amanda’s apartment in the North End. I initially thought Amanda was going to go out to dinner with her friends at a work a nice restaurant, but I would be in for a surprise later on that night. The night began with discussion that Brian and I would meet his friend Rich Kei at the local restaurant/bar The Living Room for drinks. When Brian and I walked into into The Living Room, we were approached by friends and family members who carefully hid in the main room at the restaurant. It was at this moment that the guests yelled “Surprise!” to me. The guests consisted of Mom, Dad, my younger brother Keith, Amanda’s father Jim Smith, Brian and Rich’s friend Anthony Leone and his wife Sarah, and Amanda’s friends Liv Fahey and Marisha Gadowski with her fiance Spencer. At the surprise party, I received many great gifts from friends and family. They included a framed picture of me with Amanda’s golden retriever Summer, a dog themed calendar, and several cases of beer. There were also delicious foods, such as buffalo chicken apps and birthday cinnamon French toast sticks, and a mostly 80s music playlist supplied by the DJ. The guests and I were dancing to the music that blared from the background and we talked about what 30 years of life has meant to me. The surprise party was a truly great event and easily one of my favorite birthday parties of all time. On my actual birthday, Friday the 18th, I went to out to eat at Besito, an upscale Mexican restaurant located inside the Burlington Mall. I went with Mom, Dad, Keith, and Keith’s girlfriend Malorie. Brian and Amanda were unable to attend since they were at a friend of Amanda’s wedding in the Cape for that weekend. I chose this restaurant since it fell on the annual Restaurant Week of August in Massachusetts. For the meals, I got quesadillas and several small tacos. I enjoy Mexican cuisine and choosing this place was ideal for my big 30th birthday. Last but not least, yet another birthday party took place, the following day, Saturday the 19th. Mom and I set up my grandmother’s beach house in Marshfield to include special 30th birthday materials. Many of my relatives showed up including my cousins Siobhan, Ryan, Henry, Luke, Connor and Dylan, as well as Keith and Malorie, Aunt Lorraine, Aunt Sheila and her husband Bob, Uncle Sean and his wife Lynne, Aunt Kathy, and Uncles Larry and Kevin. There were even canine visitors in the form of Dublin, Siobhan’s chocolate lab mix and Eddie, a Brittany Spaniel mix. The party was held at Nana’s house since my beach house is still in the process of being revitalized. The beach that day was warm and foggy, but pleasant weather for the day. 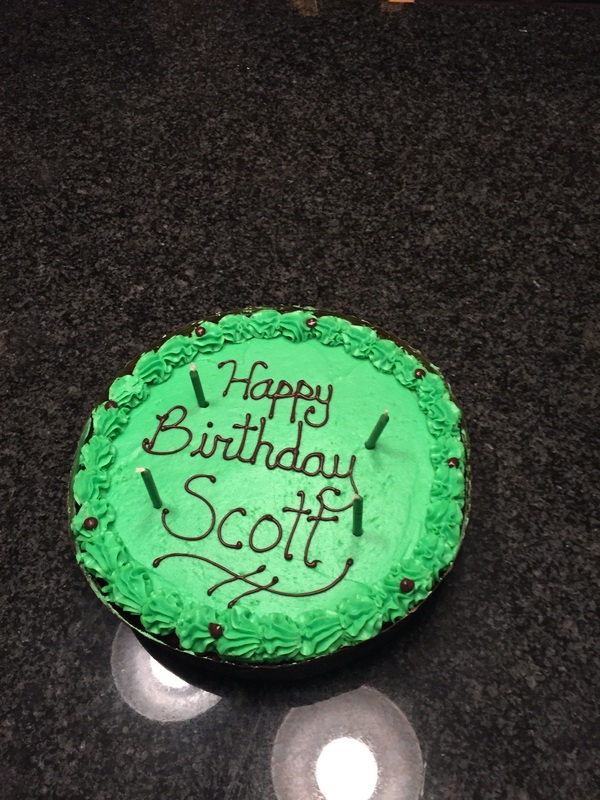 This year, my birthday cake was a chocolate mint chip cake from Sweetcakes in Marshfield. I am a huge fan of chocolate mint cakes and this cake was no exception. The earlier dinner had consisted of chicken parm and other Italian dishes catered from Mamma Mia’s in Marshfield. I received even more gifts that day, including an Alexa speaker from my parents, several checks, a golden retriever logo themed koozie and golden retriever themed pillow from Siobhan and several Amazon gift cards. It was a fabulous birthday celebration filled with many great people and a few dogs as well and a true day to remember. In the past few weeks, I had at least a few momentous events going on in my life. Summer is my favorite season and there is no shortage of activities to celebrate during this warm time of the year. I celebrated the 3rd and 4th of July in Marshfield at my beach house as a part of my annual tradition. I like to watch the fireworks go off near the beach on the night of the 3rd with many family and friends. I also got my chance to see the legendary singer-songwriter Bob Dylan in concert at the Bank of Pavilion in Boston on July 14th. It was my first time witnessing Dylan in a concert venue and I felt very honored to go the show. During the weekend of July 1st-4th, I headed down to my summer house in Marshfield to get ready for the big 4th of July festivities. On the morning of the 3rd, my older brother Brian and his fiance Amanda came down to Marshfield for the weekend, as well as my cousin Chris and several other relatives and friends. During that warm afternoon, we went down to the beach to socialize and go in the ocean and take long walks. On our walk, I encountered three beautiful mini labradoodles and their owner. The dogs are named Cocoa, Zoey, and Sailor. I learned from the owner that he has a son with autism and that the dogs are good for people for allergies. The owner has his breeding organization based in Plymouth. I have always wanted a dog, but have not able to get dogs of various breeds due to allergies to thick fur, saliva, and dander. I may look into getting a mini-labradoodle. The evening of the 3rd began with catered Italian food from Mamma Mia’s in Marshfield. The cuisine featured such delicacies such as chicken parmesan, lasagna, and a broccoli-pasta combination. The desserts consisted of treats like a patriotic themed chocolate chip pie and cake. Then came the celebration of the fireworks. I watched the fireworks from the porch of my grandmother’s cottage just two blocks up from my house. I observed the fireworks with Brian, Amanda, Chris, Keith, my cousin Tim and his girlfriend Emily, and several other family members. The fireworks were very exciting and came in an assortment of various beautiful colors. I managed to some great photos of the fireworks in the distance. I concluded the evening by heading to a friend’s house to watch a house concert that was being performed by the Red Evans Band. They played many different covers of popular songs of the past few decades. The next day, the 4th, started with really great and warm weather. 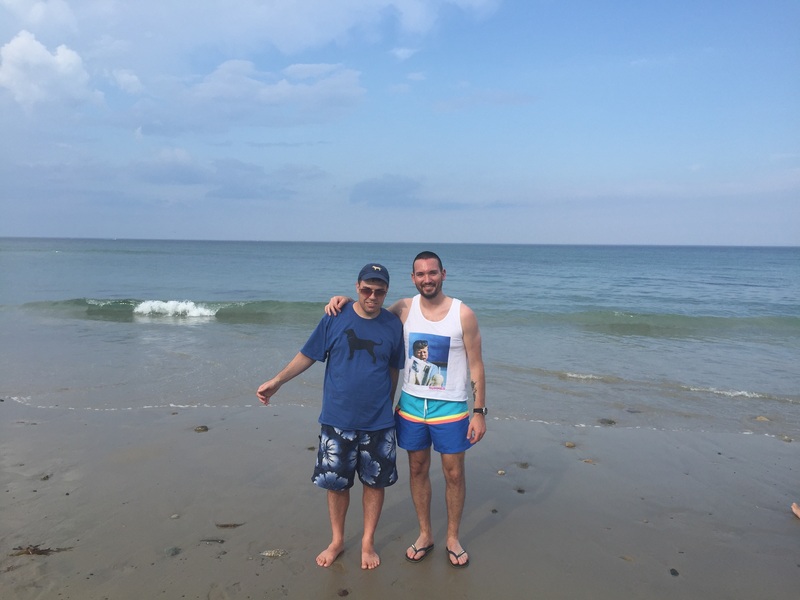 At the beach, I got to see additional family members such as Aunt Karen and Uncle Dan, along with Cousin Sean and his wife Debbie, his brother Matt, and his sister Kaylene with her boyfriend Kent. It was fun to dive into the water on this warm summer day, as talking with friends and family about things going on in our lives. I stayed at the beach until a little bit after 6 and enjoyed some drinks with Brian, Amanda, Chris, Karen, and Dan. The food for the 4th consisted of traditional summer dishes, including clam chowder, burgers, and lobster rolls. After the supper ended in Marshfield, I then headed back to Billerica, and on my way home, I saw some even more great fireworks bursting driving through Boston. On the evening of July 14th, I headed into Boston to go see Bob Dylan at the Bank of Pavilion near Boston Harbor. I first went out to eat at Babbo Pizzeria with Brian, Amanda, Amanda’s parents Lisa and Jim, Amanda’s aunt Laura, and Laura’s son Willie. It was Willie’s 24th birthday and we had pizza and pasta for his birthday. I tried a delicious meatball pizza for supper, along with the pasta. After dinner, I headed over to the Bob Dylan concert with Lisa, while Laura, Willie, Jim, Amanda, and Brian went back to Brian and Amanda’s apartment for the time being. The Bob Dylan concert opened with Mavis Staples. Mavis performed some of her hit songs for the warm-up. She got the crowd dancing and singing along to The Staples Singers’ signature song “I’ll Take You There.” After Mavis left the stage, the legend himself, Bob Dylan, showed up to the stage to perform his music. He wore a cowboy hat and played guitar, piano, and harmonica that night. Dylan played a mix of old and new songs, including “Things Have Changed”, which won him an Oscar for Best Song for the movie “Wonder Boys”, as well as “Tangled Up In Blue”, “Beyond Here Lies Nothing”, and towards the end, one of his best songs, “Blowin’ In The Wind.” For a life-long Dylan like me, it was great to hear him sing a wide variety of songs that he wrote during his long and industrious career. I hope to see more Dylan shows in the future, as well as checking out concerts from other music greats. Here’s my brand new poem. Last Saturday, I gave a speech to discuss how autism and poetry allow me to become my own best advocate for the autism community. It was held at the Best Western Royal Plaza Hotel & Trade Center in Marlboro. 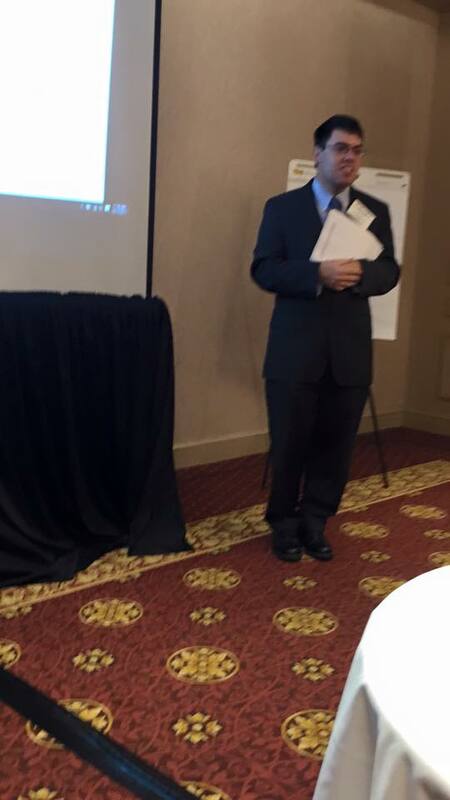 I was encouraged to participate in this event by my job coach, Orlando Torres, after seeing an email in my inbox detailing a conference for self-advocates with intellectual or developmental disabilities to participate in and choose the topic of their expertise. Since I have written at least 10 poems in my life, I figured that it would be good for me to join this event since I use my poetry to reach out to others in the autism community and among my neurotypical family and peers as well. At around 11:30 AM, I gave my speech about autism and poetry entitled “Do It the Write Way!” In the presentation, I mentioned how I use my poems and songs to become a strong advocate for people with autism and how the creative process for my poetry works. I talked about my poetry helps to express my true inner emotions and that I would like my songs to help change people’s perspectives of people with autism. Songwriters like Bob Dylan and Leonard Cohen have influenced my way of using expressive language to describe my personal feelings about the subjects in which I discuss in the poems. I also mentioned how I like to discuss the rough drafts of my poems with my family and friends to see if I’m going in the right direction with the rhythmic patterns of the poems. In between slides of the presentation, I did a question and answer question to get their reactions of wanting to know how my poetry works. I concluded the session by reciting two poems of mine called “Just a Normal Day” and “Acceptance of Autism” and then asked the audience to try to come up with poems of their own to get a feel of the creative process. Later on that Saturday, I headed over to Boston to join my brother Brian and his girlfriend Amanda to attend The Dirty Dottys show at the Hard Rock Cafe for the Finals of the New England Music Awards show. The band is fronted by Julie DiOrio, a talented vocalist and guitarist of whom I attended high school with, along with Ellie Foster and Maura McGillicuddy on backing vocals, Austin Arroco on trombone, Jonathan Kessler on the drums, and Danny Teza on the bass. I have previously seen the Dottys at least 5 times, including at Temple Shalom Emeth in Burlington, The Aeronaut Brewery in Somerville for their album release party around Christmas last year, and a few other locations in the Greater Boston area. They had previously won the Semifinals at Hard Rock on September 18th during a battle of the New England bands competition. After winning the Semifinals, I felt obligated to attend the Finals round to continue to show my support the band. At around 9:30 PM, Brian, Amanda, and I arrived at the Hard Rock Cafe to get ready for the Dottys’ set to commence in the New England Music Awards Finals. We met up with Amanda’s friends Katie Phillips and Allie Miller in the main stage room. After listening to a few of the other runner up bands in the Finals, it was time for the Dottys to take the stage. We were very excited to see them perform and danced and sang along to their catchy soul, rock, and ska infused tunes. The band performed songs such as “Shaky House,” “Not to Call,” and a few other memorable songs. At around midnight, it was announced that the Dottys had won the Last Band Standing prize for bands in Massachusetts. I congratulated them on a job well done and made sure to spread the message to family and friends. This last week, I turned 28. It was an eventful week of fun activities and memorable moments. I got to hang out with various family members and friends during the course of the week. Most importantly, I viewed my birthday as another new chapter in my life. On Friday, August 14th, I attended the Bruce Hornsby concert at Boarding Housing Park in Lowell with my cousin Kaylene and her boyfriend Kent Taylor. Like me, Kent and Kaylene are both avid Bruce Hornsby fans and naturally, I accepted their invitation to the concert back in April. Kent and I were just a few feet from the legend himself. Bruce played an amazing combination of both his newer songs and classic hits such as “The Way It Is,” “Mandolin Rain,” and “The Valley Road.” He also had a great backing band to create the wonderful combination of musical versatility. Bruce himself is very adept at playing instruments, including the piano (his primary instrument) and the Appalachian folk dulcimer. Hornsby also told amusing anecdotes about his personal life, including the fact that his son Russell doesn’t really like the school aspect of life. This inspired Hornsby to write a song about his son’s encounters in school. We all had a wonderful time at the concert and it was an experience I’ll never forget. On the way home from the concert, I introduced Kaylene and Kent to the music of The Lone Bellow, an alternative country/folk/roots rock band. I hope to see The Lone Bellow in concert someday. The next day, I had a birthday party at my summer home in Marshfield. I got to see many friends and family, including my brother Brian, Brian’s girlfriend Amanda Smith, cousins Matt, Luke, Pat, and Henry, Aunt Noreen and Uncle Chuck, Brian’s friend Rich Kei, and Rich’s girlfriend Meg Mahoney. I also got to meet a new female companion of Matt’s named Danielle, whom Matt met through week. She is a very nice person and got along really well with me and my relatives and friends. The beach weather was nice that day and it is always fun to socialize with company at the beach. The food for my birthday consisted of chicken parm calzones, hamburgers, Chinese and chicken sausages, and a chocolate chip cookie dough ice cream cake from Dairy Queen. My birthday gifts consisted of items such as Ray-Ban sunglasses from Brian and Amanda, Shipyard Pumpkinhead beer and Nordstorm gift certificates from Matt and Danielle, Vineyard Vines clothes and a picture frame of me and Ollie, Meg’s white golden retriever, and birthday cards from Noreen, Aunt Kathy and Nana, and Uncles Larry and Kevin. Sunday morning was an interesting birthday week day for me. I got to see my cousins Luke, Chuck, and Henry, the three sons of Noreen and Chuck. 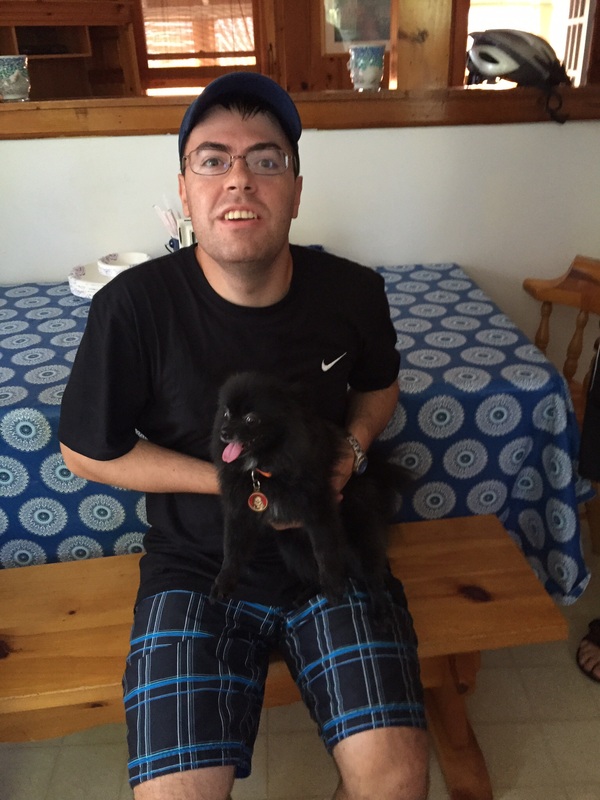 That morning, I got to meet Chuck and his girlfriend Alice’s black Pomeranian, Gumshi. Gumshi means “black” in Korean. He is a very friendly dog and pretty easy to handle. Gumshi is not much of a barker and seems to like being held by me. I love meeting new dogs and I do hope to get a dog that is similar in temperament and size to Gumshi. Finally, my actual birthday arrived on Tuesday, August 18. I reached my 28th year in my life. I received plenty of well wishes on Facebook, in email, and in texts. My favorite birthday post on my Facebook wall came from a photo that Amanda posted of her golden retriever, Summer wishing me a happy birthday with a sign that was placed onto her front body. 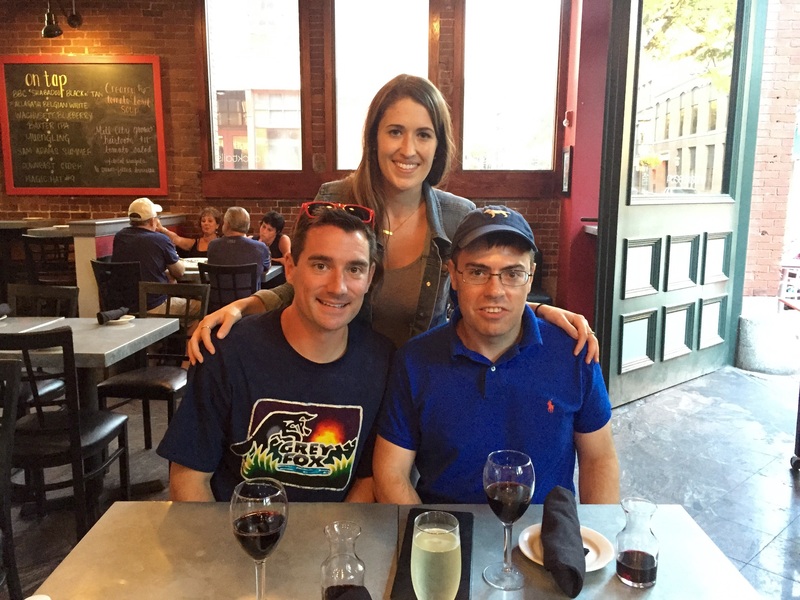 I went out to eat at Assaggio in the North End with my family. I had a great chicken parm dinner with salad on the side and white wine as my drink of my choice. My parents also got to visit Brian’s new apartment in the North End on Commercial Street and got to visit the rooftop of the apartment as well. The night concluded with my family singing “Happy Birthday” to me and I had a delicious birthday cake dessert of a chocolate mint cake from Lakota Bakery in Arlington. In my 28th year, I do look forward to gaining even more new friends and hope to pursue more career activities and opportunities. 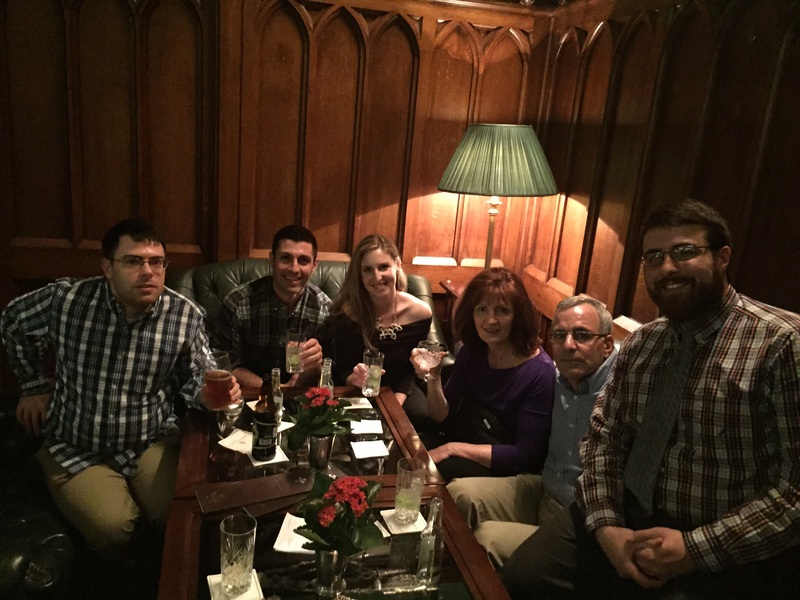 During the week of April 18th, I traveled with my family to Ireland. I got to visit such places as Cliffs of Moher, Cork, The Blarney Stone, Ashford Castle, Kilkenny Castle, and Bunratty Castle. I also tried some of the pubs in the country and tasted different beers, such as Guinness, Bulmer’s Cider, and Smithwicks. Most importantly, I found the people in the Republic to be very friendly and accommodating. I left Boston on the evening of April 18th and landed at Shannon Airport on the morning of the 19th. We stayed in the town of Adare for our first day in Ireland. That afternoon, we visited the nearby Cliffs of Moher on the coast. I first went inside the nearby museum, which gives a history of the Cliffs were formed and mentiones the fauna that exists in the region, including puffins, various fish, and seagulls. The Cliffs themselves were very breathtaking and reminded me of a peace of Heaven on Earth. I could see a small region of the Aran Islands from the view of the Cliffs on this bright and sunny day. We concluded the day by going to a pub called Pat Collins Pub, where I had a nice and warm Guinness with my meal. The next two days, we went to Cork, further east in the Republic. We stayed at the luxurious River Lee Hotel in downtown Cork. On Monday, we checked out much of downtown Cork and the shopping centers, where I bought Ireland themed clothing to add to my collection. Later that night, my brothers Brian and Keith, Brian’s girlfriend Amanda and I went to check out Oliver Plunkett’s Pub in the city, where we saw a folk singer do a hilarious Irish themed rendition of Simon and Garfunkel’s “The Boxer” and other songs. On Tuesday, we visited the Blarney Castle, just outside of Cork. We entered the castle, which was built in the 13th Century. We all walked up the flight of the stairs with the help of the railing to see the Blarney Stone. I didn’t kiss the Stone, which I was told by others has been urinated on by visitors in the past. In order to kiss the stone, one has to bend over and hold onto a railing to get a kiss of this legendary site. After leaving the castle, we then took a look at the nearby gardens and rock formations, including Druid’s Castle, Witch’s Cave, the Wishing Steps, and the Poison Garden, which contains various poisonous plants. Next, we all to went to the local gift shop to buy more Irish souvenirs and had lunch at Muskerry Arms. We left Cork the next morning to go to Kilkenny. Much of the day in Kilkenny was spent visiting the Kilkenny Castle. I got to learn about the history of the castle during the visit. The castle opened in 1213 and was owned by the Butler Dynasty for centuries. I also realized that there was a fourth wall to the castle as well, but it was destroyed by Oliver Cromwell and his forces in the 17th Century. We finished off the night by enjoying a good dinner at Kyteler’s Inn, which was highlighted by Irish folk music. The next day, we headed off to Ashford Castle on the County Galway-County Mayo border. The castle itself was very majestic and saw a great view of the lake called Lough Corrib and the beautiful fountain on the grounds. We a took a walk around the castle and got to see beautiful gardens with pretty flowers and also saw a tennis court and some locations that was used for the movie “The Quiet Man.” We had a nice lunch of sandwiches and scones served with tea after the long walk and had a great supper at the restaurant in the basement called Cullen’s, which is modeled after a medieval dungeon. It’s no wonder why Pierce Brosnan decided to have his wedding at this luxurious castle. Friday, the 24th, was the final eventful day of the trip. That day, we stayed at a hotel near Bunratty Castle. The highlight of the day was participating in a medieval banquet at Bunratty Castle. To accurately reflect the feel of medieval Ireland, guests eat their food by hands and a dagger knife and drink mead and wine with the food. The foods consisted of ribs, potatoes, chicken and vegetables, and dessert. It was great to see the actors reenact the history of the castle and sing various important Irish songs during the banquet. One of the actors frequently stopped by our table and I realized that when he is not acting, he is an accountant, which delighted Brian, who is a certified public accountant. My family and I also bumped into my Aunt Sheila’s friend Kathy Pernock with her husband, Chris and her siblings during the visit to Bunratty Castle. The Ireland trip was a great adventure. I wish I could have visited Dublin, Dingle, the Ring of Kerry, the Aran Islands and Galway, but time was limited and had to leave for the States the next morning.